The Troopers drum line performs outside the U.S. Space and Rocket Center in Huntsville, Alabama. 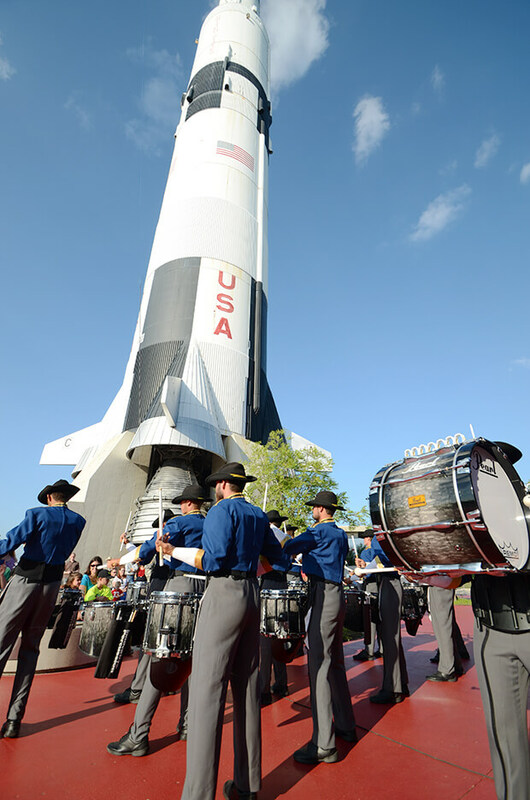 The Saturn V rocket, the iconic behemoth that blasted Apollo moon men into the heavens, served as a backdrop Thursday evening when the drum lines of the Troopers and Crossmen performed at the U.S. Space and Rocket Center in Huntsville, Alabama. 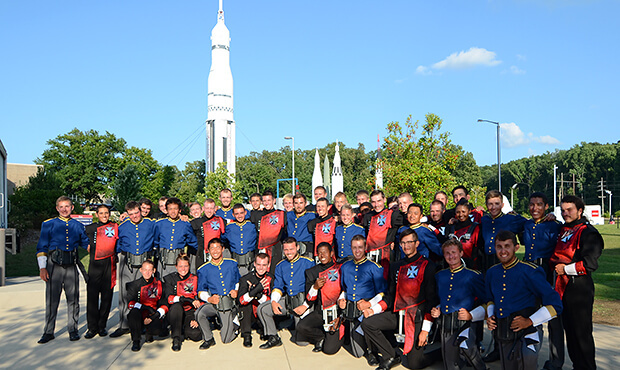 The two corps put on a DrumLine Battle at the venue that's part museum, part theme park and part educational facility; a place that thousands of students come every year for space camp and other classes. The performance helped promote the DCI North Alabama summer tour event to the local Huntsville community that will take place at Alabama A&M's Louis Crews stadium on Friday, July 25. "It was killer," Crossmen snare drum section leader Brandon Fish said about performing at the Space and Rocket Center campus, which is dotted with displays of the NASA space program in its heyday. "It's been fun this year doing DrumLine Battles not only in stadiums but in different venues. Coming to the space museum is a really, really cool experience," Fish said. Post by Drum Corps International. Both the Crossmen and Troopers took time out of their regular rehearsal schedules Thursday to be a part of the performance that also included a concert by the U.S. Army Materiel Command Band's nine-piece rock/funk group. The ensemble's soldiers are stationed at the Army base in Redstone Arsenal near Huntsville. "This is a great exposure for the corps to push these kinds of shows," Troopers director Fred Morris said. "It's important to show the local community what's going on in their own town that they're maybe not aware of." Troopers and Crossmen will both perform at DCI North Alabama on Friday evening, an event that will be sponsored by the U.S. Army Music Program. The show will kick off with a SoundSport competition featuring three different groups beginning at 5 p.m., before the first drum corps steps off at 6:30 p.m. The Troopers and Crossmen drum lines following a DrumLine Battle to promote Friday's DCI North Alabama event. Morris says that the Troopers have been busy rehearsing several changes to the corps' competitive production that members are eager to perform. Both the Troopers and Crossmen have been especially competitive in recent days as they eye a spot among the top 12 corps that earn a spot at the season-ending DCI World Championship Finals in August. "We're on the cusp of breaking 12, so we're really pushing hard," Morris said. "It's going to be an exciting two weeks until the end of the season."